If the test is a success, consumers can expect to see the new machines popping up around the country. A new soda machine in San Diego is offering hundreds of choices instead of the usual half-dozen. The machine is being tested in only a few metropolitan areas of America, including in San Diego County. Sure, you still push a button to fill your cup, but the difference now is that the computer age has caught up with soft drinks. 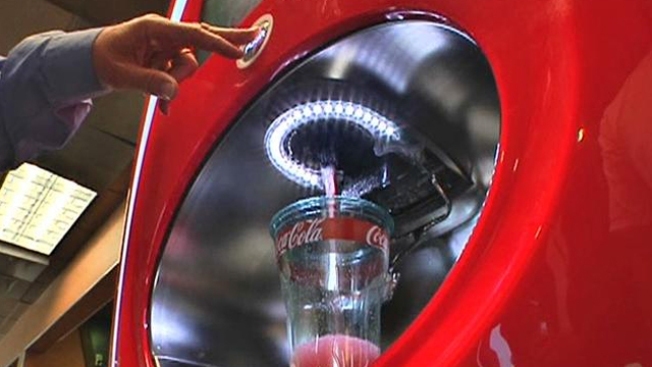 Coke is test marketing the new high-tech machine called the Coca-Cola Freestyle. It's in 10 San Diego Jack in the Box restaurants along state Route 78 in North County as well as in a few stores in Salt Lake City and Atlanta. “We feel it's going to totally revolutionize the fountain business,” said Coca-Cola spokesman Gene Farrell. A touch screen offers more than 100 flavors to consumers. “We're absolutely thrilled to be able to offer more choices than are available at a convenience store, at a grocery store -- we have such a variety of choices that it's incredible,” said Suzanne Schlundt of Jack in the Box. The initial screen offers 19 drinks, but within each choice is a selection of flavors, including six Coke flavors, five Sprites, eight Powerades -- and on top of those are zero-calorie and caffeine-free options. The questions now are: Will people like the new fountains, and more important to Coke and Jack in the Box, will they buy more soda? That's part of the test. Even with all the choices, the soft drink giant admits that most customers will probably stick to their old favorites. One concern is that only one person can use the fountain at a time. Coke figures it will take customers longer the first time, but believes that people will catch on quickly.